An energy-mechanical approach to developing analytical failure models of stationary tribological conjunctions has been suggested. The design calculation methodology of their durability prediction has been developed on its basis. 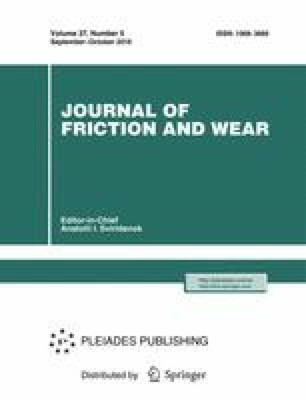 The methodology was used to predict the durability of standard friction pairs of the disc–shoe type, abraded under different conditions of frictional interaction. To verify the theoretical results, the statistically significant experiment on an SMT-1 friction test machine was carried out. The effectiveness of polymeric and metal-polymeric coatings to increase the durability of the studied conjugations was evaluated using computer and laboratory experiment. The most effective solutions obtained in the experiment were introduced into industrial production. Original Russian Text © A.V. Antsupov, Jr., A.V. Antsupov, V.P. Antsupov, M.G. Slobodianskii, V.A. Rusanov, 2016, published in Trenie i Iznos, 2016, Vol. 37, No. 5, pp. 636–642.